Join San Luis Obispo public radio station KCBX in presenting Democracy Now host Amy Goodman, October 20 at the Spanos Theater on the Cal Poly Campus, beginning at 1:30pm. Goodman will be speaking as a part of The Silenced Majority tour, a 100-city journey to promote the book of the same name. The tour began at the Republican National Convention in Tampa and will continue until Election Day. Traveling through electoral swing states, the tour will examine how and why citizens are organizing across the US, discuss voter ID laws, and address the impacts of Citizens United and massive campaign contributions. Goodman, along with Denis Moynihan, will be speaking about the sequel to their 2006 New York Times bestseller, Breaking the Sound Barrier, as part of a fundraiser for KCBX. Goodman is the veteran host and executive producer of Democracy Now!, the independent war and peace report that airs on weekdays on public radio stations across the world. 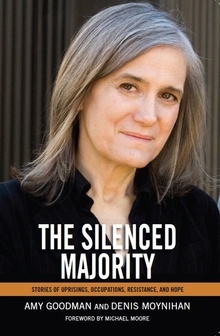 She is the first journalist to receive the Right Livelihood Award, popularly known as the “Alternative Nobel Prize” for “developing an innovative model of truly independent grassroots political journalism that brings to millions of people the alternative voices that are often excluded by the mainstream media.” Among her many accolades, Goodman is the a co-recipient of the Izzy Award presented by the Park Center for Independent Media, the James Aronson Award for Social Justice Reporting, the American Women in Radio and Television’s Gracie Gracie Award, the Puffin/Nation Prize for Creative Citizenship, George Polk Award, Robert F. Kennedy Prize for International Reporting, and the Alfred I. duPont-Columbia Award. Tickets can be purchased for $25 per person through the KCBX website.